The Birmingham Pals are a group of dedicated military and social history enthusiasts whose aim is to educate the public about different aspects of The Great War in an entertaining and interactive way. We are able to stage Living History displays as well as arena displays including blank firing. We also undertake film and television assignments. Do you want an interesting and exciting hobby? 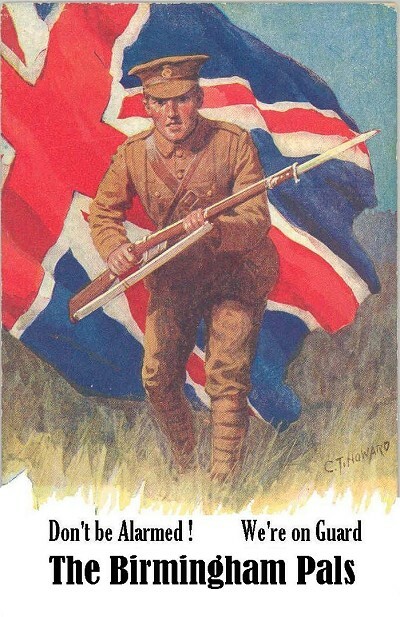 Why not join us in The Birmingham Pals Living History Association. To find out more about working with us please visit our Bookings Information Page. To visit the "Index" page of each of the main sections of this website click on the section description (eg "Contacts" or "Sections") in the Navigation Menu above. To visit pages within the section click on the numbered button to the right of the section description to be taken to the sub-menus.